Together they form the largest freshwater reservoir on Earth: Lake Tanganyika and Lake Malawi, both within the East African Rift – and both amongst our planet’s deepest and largest lakes. A vast unending expanse of blue from above; while below, a spectacular coloured wonderland filled with mysteries that scientists are still working hard to understand. This submerged world is filled with power struggles, love and intrigue. It is the realm of the cichlids. Unlike all other lakes in the great African continent, evolution can be seen happening in Lake Tanganyika every day, powered by the unbelievable competitive pressure that dominates the world of the cichlids. Scales are ripped off live fish by the brutal Perissodus cichlid; while whole homesteads are looted by other aggressive species. In simple terms – big cichlids eat small cichlids in a constant battle to survive. But that’s not the end of it, because other battles wait to be fought – and mostly lost – with even bigger creatures! Thieving otters, swift cormorants and huge turtles ready to dive, pursue and ambush unsuspecting cichlids. With so many hunters about, the cichlids must raise their young quickly and effectively. This imperative has resulted in some ingenious behaviours. Some cichlids hatch their young in their mouths – others hide their young in empty snail shells. The problem is, some predators have adapted to overcome these cichlid tricks, like the mud cats – the cuckoos of this underwater world. They stow their own eggs amongst the cichlids’ eggs. 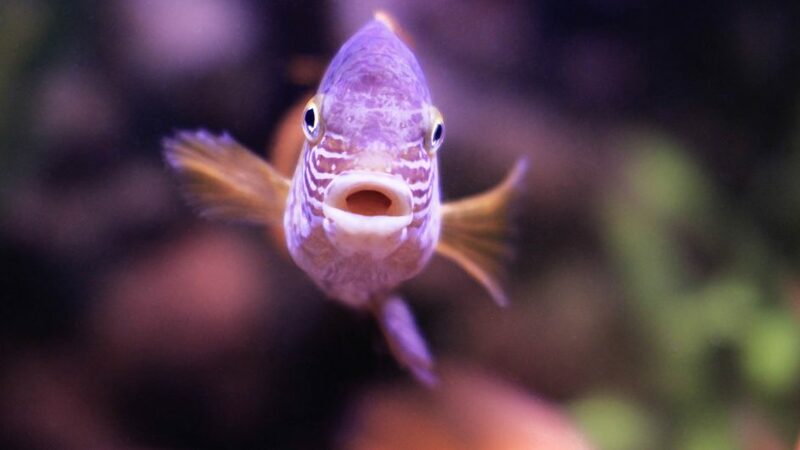 The cichlids that raise their young in their mouths, inadvertently raise the mud cat’s young as well. It’s a war in there. When it’s time for the babies to be released, the predatory mud cat’s young are the only ones left. They enter the big, watery world, strong and healthy, with bellies full of young cichlids. Lake Malawi is located south of Lake Tanganyika. Nearly 500 types of fish live here, more than in Lake Tanganyika. Here, unique predatory behaviour abounds: one type of cichlid plays dead to lull his prey (aka predator) into a false sense of security. When the prey is within striking distance, the cichlid comes to life in a burst of energy to attack. This behaviour has earned the fish the nickname “sleeper“. Once a year strange black clouds form above the lake’s surface when myriads of midges hatch almost simultaneously. It’s a mass love-in, to create, and make way for the next generation. The female midges die after depositing their eggs, and their dead bodies cover the lake – providing an annual banquet for the sardines. Lake Tanganyika and Lake Malawi – their depths filled with wonder and drama; and extraordinary fishy tales ready to be told. Thanks to the highest quality underwater cinematography this film reveals the hidden realm of the cichlids in Africa’s greatest lakes.